There are a couple things that are universal in political campaigns. Candidates will talk about creating new jobs and stress the need to leave a legacy for our kids and grand-kids (we do all for the kids, after all). In recent years, with environmentalism becoming increasingly popular politically, politicians have combined these two things in an effort to create green jobs. This has included everything from wind turbines to solar farms to hydro-electricity. It’s not so simple, however, as the concept of green energy and green jobs needs further examination. One such example comes from the Site C Dam in the Peace Valley of Northern British Columbia. In 2010, the provincial government announced its plan to build a new dam, the third one on the river. In promoting the project, the government highlighted new jobs and green energy as key benefits to the project. For many local to the area, however, the project’s benefits were not so clear cut. For many First Nations in the area, the dam would destroy land significant from both a cultural and ecological value. At the same time, there were questions about the province’s need for more hydro-electric energy. Three years after the initial announcement, Sarah Cox started travelling to the Peace Valley to investigate the dam. 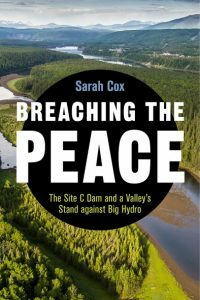 The product of that research is her new book Breaching the Peace: The Site C Dam and a Valley’s Stand Against Big Hydro. Cox examines the project in an effort to determine its true cost, both from a financial and cultural perspective. She explores the urban-rural divide, settler colonialism, and how power and political expediency shape these types of decisions. With Breaching the Peace, Cox movingly challenges the reader to examine the underlying motivation for public projects and consider how they can change lives for those directly influenced. While not a historical work, Cox makes tremendous use of historic precedents and trends in exploring the Site C project. As a result, the book is an outstanding of Active History and how understanding the past can help us make sense of the present. In this episode of the History Slam, I talk with Sarah Cox about the book. We talk about Site C and the Peace Valley, the ecological costs of dams, and the financial cost of this project. We also talk about the political motivation, colonial influence, and urban-rural tension that have shaped the project and the public’s perception of it.